More than two billion people in the world don’t get enough essential vitamins and minerals—micronutrients—in their daily diets, a condition known as hidden hunger. Even if they get enough food to fill their stomachs, that food may lack what their bodies really need to thrive mentally and physically. 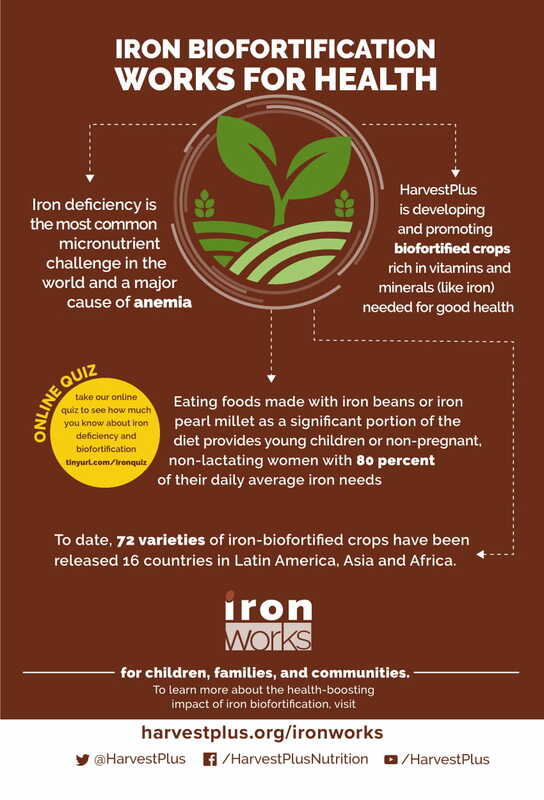 Iron deficiency is the most common form of hidden hunger and it’s a serious global problem that leads to impaired mental development and learning capacity, weakness and fatigue, and adverse pregnancy outcomes when it progresses to anemia. In low- and middle-income countries, roughly one in four women of reproductive age are anemic due to iron deficiency, as are two in five young children. This is a big nutrition issue. The best solution to iron and other micronutrient deficiencies is a balanced diet, but the most nutritious foods are often unaffordable or inaccessible for resource-poor people. That’s where biofortification comes in as a practical, food-based solution for these people. It involves conventionally breeding staple crops to have higher levels of micronutrients such as iron, zinc, and vitamin A. It is a cost-effective and sustainable strategy making use of familiar, readily available foods that are already key ingredients in local diets. During pregnancy: improved iron stores before pregnancy reduces the likelihood of premature or small babies and decreases the risk of death during childbirth. In childhood and adolescence: improved mental performance can mean better school performance. Young children can get up to 80 percent of their daily average iron requirement by eating foods made with iron-biofortified beans or pearl millet as a significant part of their diet. In adulthood: better memory and attention capabilities bolster work performance, helping people and economies reach their full potential. 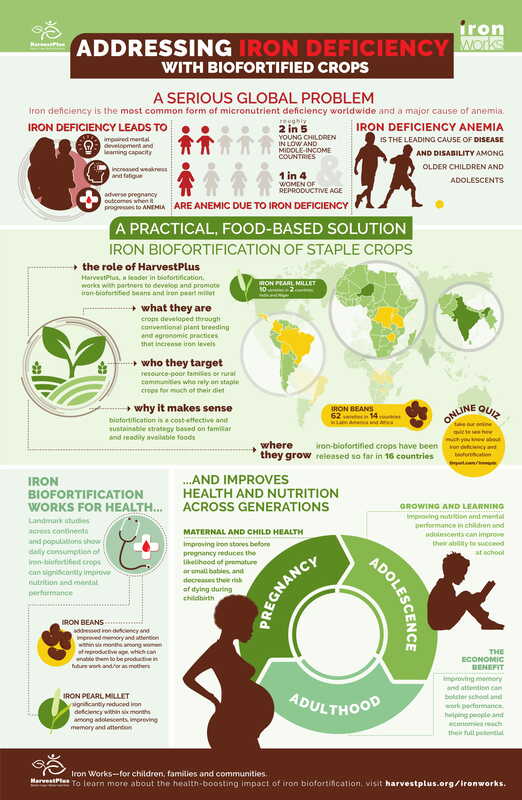 What’s more, there is strong scientific evidence that these iron crops improve health. 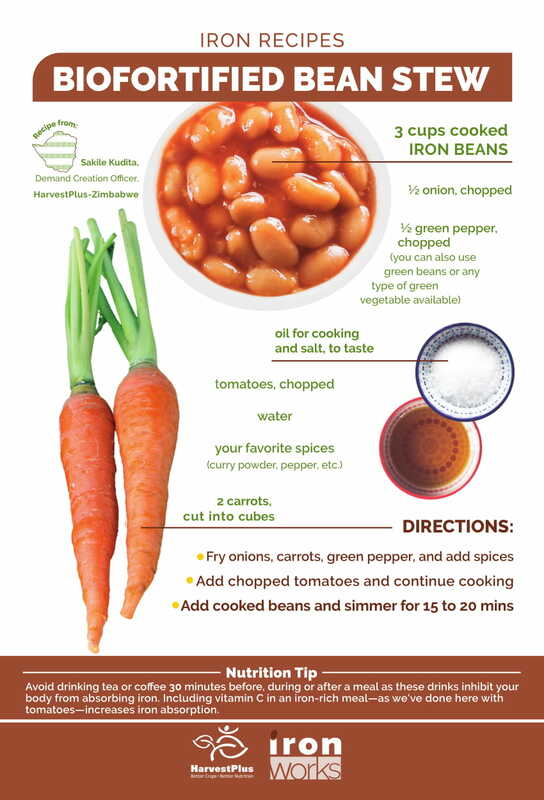 For example, one recent study in Rwanda showed how consumption of iron beans addressed iron deficiency in women of reproductive age within six months. Another involving consumption of iron pearl millet by adolescents in India showed improved memory and attention in school. Please explore and share the Iron Works digital feature, infographic, and toolkit. Stay tuned for further success stories and social content as its released in spring 2019.